This anime special was absolutely hilarious. Before you watch this, watch the original Inu x Boku SS. This anime special made me laugh out like about 5 times. I especially love the "click" scene with Miketsukami and Ririchiyo. If you absolutely adore romance anime and hilarious characters, I highly suggest the anime Inu x Boku SS and then watch this special because it is DEFINITELY worth it. I really suggest this to people who love romance anime. Overall this anime was a 10/10 for me. This Inu x Boku SS Special follows the same logic as the series, but concentrates more on the jocular aspects. Quite interesting how the protagonist remains a tsundere... although earlier it's implied she's warming up to him. Overall, it doesn't have every factor that made the main series such a carnival, but most of it... rabbit ears is still mysterious, the others still follow the same routine, except it's done in a playful manner as of now. Inu x Boku generally is quite a spectacle... most times hilarious, other moments emotional... in the end the protagonist doesn't exactly get how to interact, but still tries her best... episode 11, in my opinion, being the most marvellous; not as fast-paced, but beautiful and revealing. Inu is more complex than one might think in the beginning... it tackles diverse subjects including Japanese folklore, social awkwardness, mysticism... ultimately, the concoction might work. What ties together the anime we love? For me, it's the element of surprise - to deliver something different than what you expect, and change the way you feel about a series. 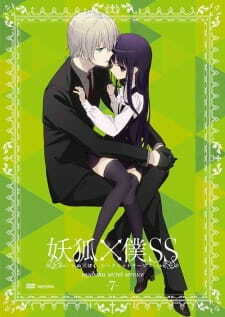 Inu x Boku SS is a tale of monsters and the supernatural, but also of secrets and love. Whether human or youkai, much can be said with a kiss.